After the amazing drive through the Beartooth Mountains we reached our first National Park on the trip: Yellowstone. To say that Yellowstone is an incredible place is putting it lightly. Around every turn there is something amazing to rest your eyes upon. Coming into the northeast entrance you are surrounded by beautiful valleys with majestic peaks on either side and towering pine forests. Littered throughout are many different kinds of wildlife, especially bison. Waterfalls cascade off of giant cliff faces into glacial melt rivers and creeks that run cold, year round, from the snow that the upper elevations receive throughout winter. The water itself is crystal clear and untouched and the landscape thrives thanks to the protection of the National Park status. The geysers themselves are extremely fascinating to watch and the landscape just feels otherworldly thanks to their presence. I can only imagine what the first settlers thought when they came over that mountain and saw the ground alive with steam from the geyser fields. If you get the chance to visit Yellowstone, definitely do not pass it up! The wallpaper this week is of a site you are probably already familiar with. 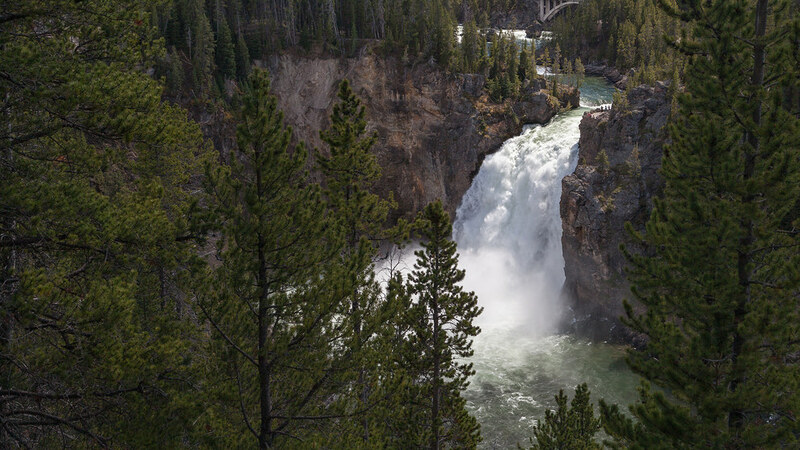 It’s one of the most popular waterfalls in Yellowstone: Upper Yellowstone Falls. These waterfalls are massive and I have captured this photograph with people standing near the waterfall to give it some scale. They truly are majestic to witness in person and the sound from the water crashing over the falls is impressive, to say the least. This wallpaper is for paid members only. Please Log In to enable downloads. Thank you so much for the feedback! If you require a response we'll be in contact shortly.